Me Too and Some Great Art Too — Stay Cool, Mom. I'm not always sure how I feel about "Facebook activism" (mostly because I feel defeated that jerks keep being jerks) but, the "me too" movement is special. I'm so proud of all of the women who've come forward and shared their experiences and, thus, created a safe space for others to do the same. So thanks and... ME TOO. Hard to believe the statistics that say that 54% of women have experienced "'unwanted and inappropriate sexual advances' at some point in their lives" (Fortune). I don't know one that hasn't. It's something we navigate on a daily basis. How many times have you calculated the risk involved in simply WALKING where you need to walk? Or just being your gd friendly self without getting called a "tease"?! And there's never a safe route, a careful way to act... My most devastating "me too" happened when I was sure I was at my strongest, with friends around and emphatic "no's" running contrary to my usual obliging nature. I was attacked (grabbed by the neck and brought to the ground) at a bar for not giving a man the attention he thought he deserved. 1) I got the satisfaction of seeing the guy handcuffed and brought into a cop car. 2) I got to talk to friends and family about it. Since it happened in such a public place, it became public information quickly. Being able to talk about my experience made it easier to bear. 1) I didn't trust my instincts anymore. 2) I was constantly on guard and didn't feel safe alone. I made a series of artworks about my perspective post-harassment, all centered on the theme of being prey. Here's the ONE I can find. Making art helped me understand what I was feeling. I was able to experiment, explore, and exaggerate in ways that felt cathartic. I'm always looking for artists that are able to do the same, who can make beautiful and/or powerful images and experiences from their pain, their joy, etc. As I get older, those artists are mostly women. 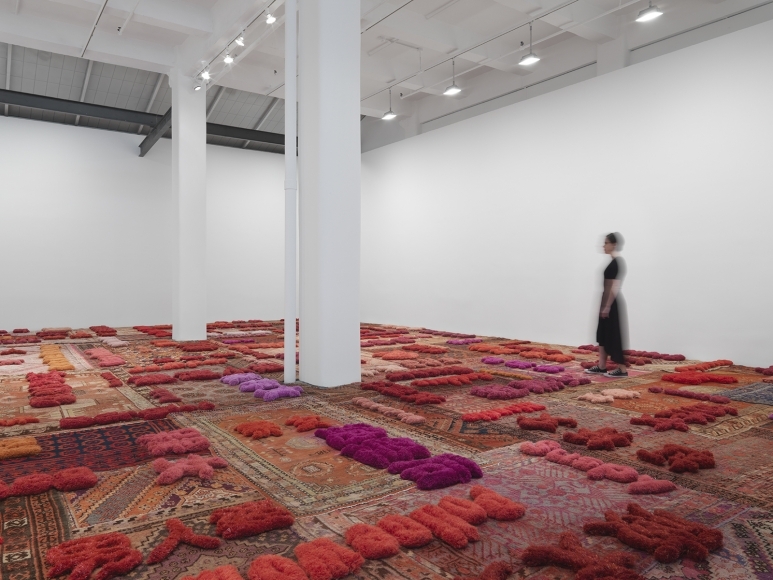 Lin Tiamiao embroiders carpets with words about women and wants you to walk all over them. 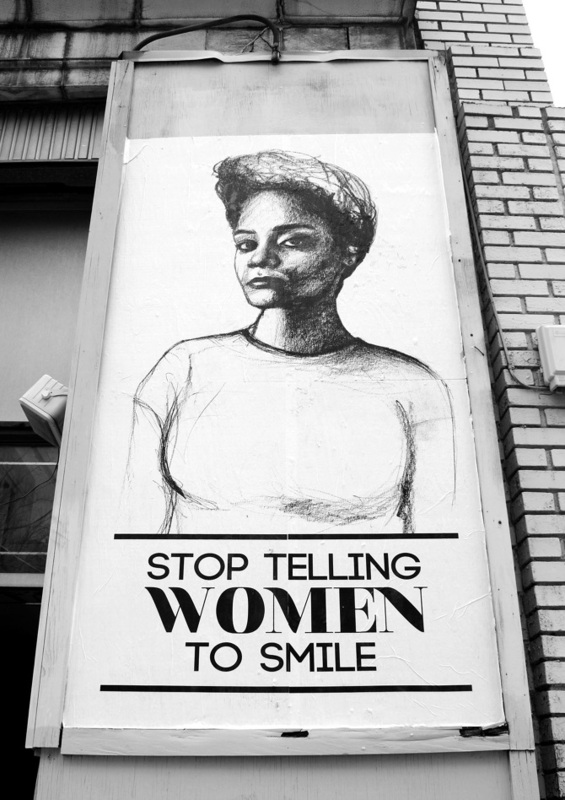 Tatyana Fazlalizadeh makes murals that send messages to men. Janine Antoni uses her body to talk about women's issues and identity. She mopped the floor with her hair and black ink in Loving Care. Barbara Kruger combines text and imagery to make statements about womanhood. Adrian Piper makes "calling cards" for social situations that etiquette requires we don't address in public. These artists empower me by saying "me too" to all the thoughts and frustrations and moments of strength I've felt throughout my life as a woman. 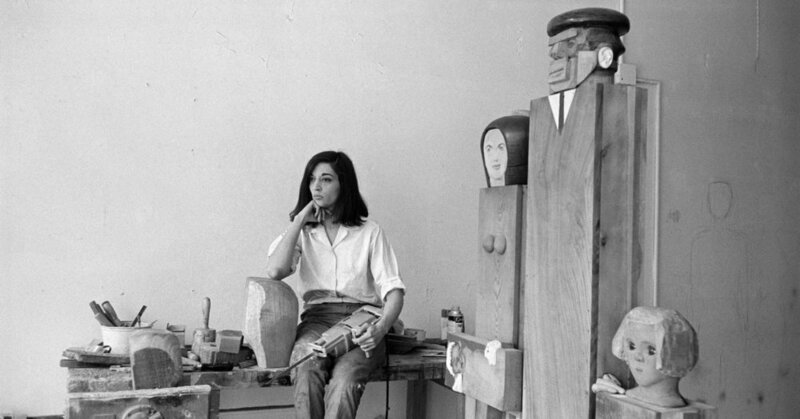 What other women artists are making you feel validated these days? 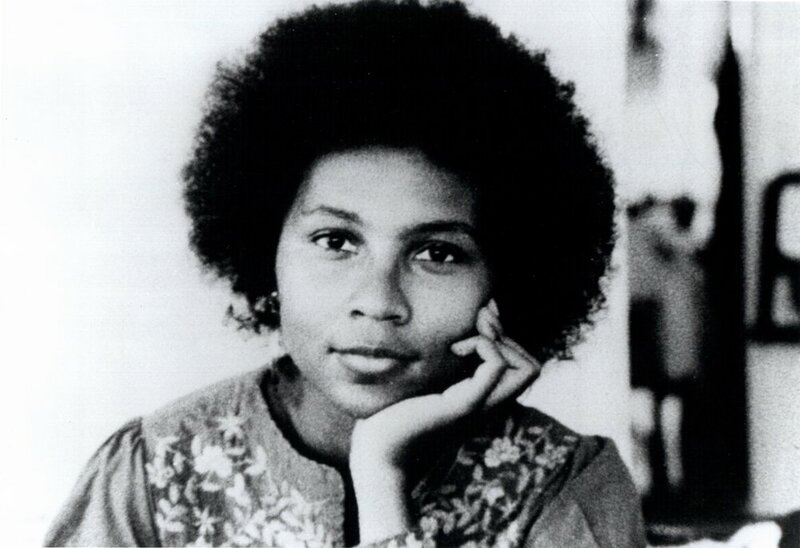 Cover image is a Calling Card by Adrian Piper.